This concludes our series on plurality leadership. Next week we will begin a number of posts dealing with various other issues in our lives as followers of Jesus. People who are used to a lead-pastor model often wonder just how plurality leadership cashes out, when it comes to making hard decisions and leading the church. What follows is a behind-the-scenes look at our meetings, our relationships with one another, and the decision-making process. I have slightly edited several pages from the last chapter of Embracing Shared Ministry. Except for the fact that five of us draw a paycheck every couple weeks, OCF knows no distinction between its seminary-trained pastors and those on our board whom other churches might refer to as elders or (in churches without elders) deacons. Indeed, in order to discourage the kind of minister-versus-layperson mentality traditionally associated with the terms ‘pastor’ and ‘elder,’ all eight of us are designated as ‘pastor-elders’, and we encourage our church to view us that way. Our weekly meetings are the key to the success of the whole enterprise. OCF’s pastor-elders gather together for an hour-and-a-half each Wednesday morning. We have no business agenda. We simply share our lives and pray for one another, and we go through the prayer requests that your folks submit each week. OCF currently has eight pastor-elders. Our tenure ranges from five years on the team to more than thirty. I have been part of the team for twenty-two years. You can imagine the kind of community we have developed by faithfully meeting and praying for one another, for so long, on a weekly basis. Over the years we have shared in countless joys and sorrows, big and small. We welcomed a number of new children and several grandchildren into the world. We have fervently prayed for shaky marriages in our extended families. And we grieved together when one of our brothers lost his wife to a long battle with cancer. We generally reserve decisions and actions related to church programs and ministry for another context, meetings that we hold one Saturday each month. It is here, at these Saturday gatherings, that the community we cultivate on Wednesdays pays big dividends to our church family as a whole. Power plays? Authority abuse? Not a chance. Denny, John, Brandon, Chris, Mark, Dan, Carlos, and I know each other too well—and we love each other too much—to let anyone get away with politicking or posturing. It is really quite amazing what happens when decision-making arises organically from a relational soil of mutual trust, respect, and admiration. We struggle through the same kind of overwhelming challenges that confront other church leaders. Disgruntled and divisive church members, immorality, financial crises, a major building program, hiring and firing staff—we’ve seen it all. And like any team comprised of opinionated leaders, we have had our share of strong disagreements along the way. People who are new to OCF, and to our team leadership model, repeatedly ask, How does this actually work out in practice, when a difficult and potentially divisive decision must be made? We each weigh in with our convictions or opinions about the issue at hand. We listen carefully to each person’s viewpoint and to the rationale for his perspective. We seek to be highly sensitive to the general direction the discussion is going, trusting that the Holy Spirit is superintending the process. A pastor-elder whose viewpoint becomes increasingly out-of-step with the trajectory of the discussion willingly defers to the growing consensus of the group. Once a decision has been made, we unanimously own it. And, of course, we pray our way through the process. Not once, during my twenty-two year tenure on the board, have we ever had to vote formally on an issue. Here is a final observation that will perhaps strike a number of you as counterintuitive: the way we make decisions as a community of leaders is at least as important to God as the ultimate decisions we make. Indeed, I have become convinced over the years that God is generally more concerned with the process than with the outcome of our Saturday leadership meetings. I often find it difficult to discern God’s will when we are making decisions in our meetings. Perhaps you have the same experience in your own ministry. While some decisions are clear-cut, it seems that in most situations there are probably a number of viable alternatives, several of which would be pleasing to God. In still other situations, I suspect that God has no preference at all. Persons who believe otherwise, and who seek vigilantly to ascertain God’s perfect will for every key decision, run the risk of completely missing a biblical reality that is indispensable to healthy team leadership. In contrast to the lack of clarity often associated with the outcome of the decision itself, God’s will for the relational integrity of the process—humility, mutual respect, brotherly love—is crystal clear throughout the Scriptures. It is, of course, quite Western to be preoccupied with outcome at the expense of process. But I don’t believe it is biblical. Indeed, it has been my experience that the Bible seldom speaks directly to the decisions that face us in church ministry. Scripture always speaks directly, however, to the manner in which we are to go about making those decisions together. 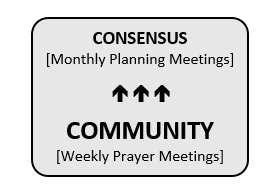 The upshot of all this for decision-making by consensus is that I am less and less inclined to confuse my personal convictions with the will of God on an issue, and I am increasingly willing to defer to group consensus when I represent the sole minority opinion at one of our Saturday planning meetings. My brothers on the board take the same approach. For we are quite confident that if OCF’s pastor-elders engage the process with integrity, God will be pleased with the outcome. So far in our series, we have focused primarily upon ways in which a team of pastors benefits a church as whole. In today’s post I will reflect on a key advantage enjoyed by pastors who minister as a team. 40 percent of pastors and 47 percent of spouses are suffering from burnout, frantic schedules, and/or unrealistic expectations. 33 percent say that being in ministry is an outright hazard to their family. 52 percent of pastors say they and their spouses believe that being in pastoral ministry is hazardous to their family’s well-being and health. 66 percent of pastors and their families feel under pressure to model an ideal family. 45 percent of pastors say that they’ve experienced depression or burnout to the extent that they needed to take a leave of absence from ministry. 90 percent feel unqualified or poorly prepared for ministry. 40 percent of pastors have considered leaving their pastorates in the past three months. Hundreds of pastors leave their ministries each month due to burnout, conflict, or moral failure. We live in a broken world that is full of broken people. Pastors are broken people, too—all of us. There will always be instances of moral failure, debilitating depression, and burnout among God’s leaders. Recent events at Willow Creek Church made the headlines only because of the size and influence of Willow Creek’s ministry. What is troubling is that these experiences have become almost the norm—rather than the exception—for people in pastoral ministry. This should not be the case. Consider the Apostle Paul. Paul certainly faced serious challenges and crises in his missionary adventures. He was beaten, imprisoned, and nearly killed. He writes of “the daily pressure on me of my anxiety for all the churches” (2 Corinthians 11:28). He exclaims, “We were so utterly burdened beyond our strength that we despaired of life itself” (1:8)! Ministry was not easy for Paul. Yet somehow Paul avoided the kind of personal emotional and spiritual crises reflected in the statistics listed above. Twice in 2 Corinthians Paul assures his readers that, despite all the physical and emotional hardship, “We do not lose heart” (4:1, 16). Burnout was nowhere on the apostle’s radar screen. Nor was depression. Later, as Paul’s life drew to a close, he confidently claimed, “I have fought the good fight, I have finished the race, I have kept the faith” (2 Timothy 4:7). What made Paul’s experience different than that of so many pastors in our churches today? We must be careful here. There is generally no silver bullet to address clinical depression, which is often a puzzling combination of spiritual, emotional, and physiological factors. Clinical depression, however, is not the issue faced by the great majority of the pastors reflected in the above statistics. Rather, it’s the daily pressures of church ministry that’s causing the problems. So, again, what made the difference for Paul? The answer, I suggest, is team ministry. We learned in our very first post (July 24) that Paul appointed a plurality of elders to oversee the churches he established (e.g., Acts 14:23). There were no senior/lead pastors in these congregations. Paul modeled this very approach with his own team of missionaries. It began in Antioch, where he shared teaching responsibilities with Barnabas, Simeon, Lucius, and Manaen (Acts 13:1). We see it continue throughout Paul’s three journeys, as described in Acts 13-21. “Paul explicitly calls no less than sixteen persons ‘fellow workers,’ and his usage, along with circumstantial evidence, suggests that he would have so identified another twenty to twenty-five women and men. Acts and the Pastorals have picked up this evidence and added another fifteen names. Paul’s association with so many fellow workers has no parallel in early Christian missionary activity” (W. H. Ollrog, “Sunergos,” Exegetical Dictionary of New Testament Theology, 3.304b). Key Question: Were the relationships Paul enjoyed with his co-workers a key to the apostle’s robust optimism about his work for Christ and his staying power in ministry? Given the common sense connection between healthy relationships, on the one hand, and human flourishing, on the other, it could hardly have been otherwise. It is now axiomatic among those who study human longevity that persons engaged in healthy relationships generally live longer. It only makes sense to assume that we will serve longer when we do so in community with others, as well. Although 55 percent of pastors say they belong to a small accountability group, 70 percent claim they don’t have any close friends. 56 percent of pastors’ wives say that they have no close friends. 25 percent don’t know where to turn when they have a family or personal conflict or issue. 20.5 percent say they would go to no one. No close friends. Nowhere to turn. Our lone-ranger approach to Christian leadership contrasts sharply with Paul’s practice of ministering in community with others. And it is costing us dearly in terms of pastoral isolation, discouragement, and burnout. I find myself deeply saddened when I think about the individual lives and families represented in these figures, in part because I find myself nowhere among the statistics. Do I get discouraged at times? Seasons of exhaustion? Certainly. That’s par for the course in the pastorate. But my family has flourished in vocational church ministry. Serious burnout has never been an issue. And I still cannot imagine doing anything else with my life. As I’ve shared in a couple recent sermons, the Hellerman family has gone through some very difficult times in the past several years. I won’t revisit the sad details here. I will simply observe that it is has been my relationship with my fellow-pastors—especially my two best friends, Denny O’Keefe and John Hutchison—that has kept me focused, obedient, and faithful to my calling as a husband and a pastor, during the darkest period I’ve experienced in forty-plus years of church ministry. I take no credit for any of this. By God’s grace, Joann and I have never served alone. We began church work as part of a relationally healthy team of youth workers back in the late 1970s. A friend recruited me to co-pastor a church plant with him in 1996. I continue today at Oceanside Christian Fellowship serving among a team of eight pastors who share all facets of ministry and who, more importantly, share our lives together.